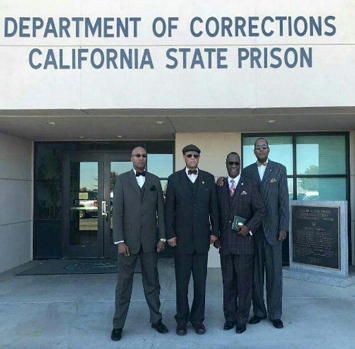 The Lancaster California State Prison Nation of Islam Study Group hosted their first Annual N.O.I. Peace & Reconciliation Conference. Special guest speaker was the Nation of Islam’s Western Region Student Minister Tony Muhammad. Also in attendance was Western Region Student F.O.I. Captain Brother Halim Muhammad and Local Student Captain for the Antelope Valley, Brother Greg Muhammad. Around 100 men attended the event which included a broad sector of street organizations and neighborhoods of Los Angeles and the Northern Bay Area. Student Minister Tony Muhammad spoke on the necessity of all the neighborhoods and (so-called) street gangs uniting all the way from L.A. to the Bay, and establishing peace, economics and alliances. Left to right: Antelope Valley Student F.O.I. Captain Greg Muhammad, Western Region Student F.O.I. Captain Halim Muhammad, Western Region Student Minister Tony Muhammad and Antelope Valley N.O.I. Student Local Representative Ansar El Muhammad. He spoke about how he once took two Rollin 60’s Crips and two Hoover Crips to Chinatown. “Can you read their signs?” he asked them. “Do you see any Black business or stores? Because this was not established for you! I wanted to teach a lesson, how other people serve and look out for themselves and their own kind first!” He said then he took them a short distance to Koreatown and to little Tijuana. Student Minister Tony spoke on how he brought the same two gangs together to discuss ending the senseless violence between them. He said they told him of all the lives lost on both sides and of all the blood shed between them and how there’s 30 years of history of them being enemies and at war with each other. This was a history making event at Lancaster State Prison where the N.O.I. Study Group has been established now for four years. “We are now in Muhammad’s time! So this means not only will Muhammad be seen, but Muhammad will be active! All praise be to Allah. The devil’s time is up!” said Brother Ansar El Muhammad, N.O.I. Student Study Group Coordinator for the Antelope Valley, which includes the prison. Be not distracted by foolishness and sport and play. We get loud and excited when the football game comes on, but not when truth is being shared. “Fruit! What team are we?” shouted Brother Ansar during his opening statements. “Team Farrakhan!” The F.O.I. on post yelled. “Team who?” “Farrakhan!” “Team who?” “Farrakhan!” the men shouted.